The first thing that is glaring is that this map is unnecessarily large. 840x800 is meant for maps that really need it. cairnswk already said it but instead of looking to add more detail, consider just making the map a bit smaller. You've got quite a bit going on already with tanks, planes, and flags. You don't want the image to look overcomplicated. Right now I'd say this image is light years beyond a draft stage. I don't really see much that needs to change except minor details. if you're going to change the red tanks and planes then please change the green tanks and planes too. they look teh ugly. maybe if they were more of a proper green colour like planes actually were/are. the neon tanks are a bit too cartoony. Gameplay on the other hand has problems. Commanders get +3 auto. I'm assuming each territory starts with 3 armies. I go first. I own Vasily Chuikov. 3 on the terr to start. 3 more from my auto. 3 more from my deploy. 9 armies take over the 3 on SU3. I didn't lose anyone! 8 armies to attack with and I have 2 commanders with only 3 armies on them! Maybe I'll only go after one of them and leave 4 armies on my two commanders. maybe someone else will grab them from me. maybe they won't but whoever owned the one I took over won't start with one. Or I guess if people only start on commanders they are out of the game? if indeed you meant to start everyone with only their commander then I'm not sure how you can fix that without putting oodles of neutral armies on map which would make things worse. Maybe start everyone on all the territories except commanders? Not sure how'd that play out. perhaps the autodeploy would have to be lessened slightly. edit: well I just saw the Planes can only bombard but my description above still stands. you can attack into Poland onto a tank and then attack someone else's commander. One commander even directly connects with a Polish Commander and can get an additional bonus by only taking out one territory. something has to change. I was planning on making it smaller after cairns suggestion. As for Gameplay, If each Plane started with a 5 neutral, and each Tank started with a 5 neutral, then this would make it more difficult for them to take another Commander. And if i made the Auto-deploy +2 then this would also make it better? And there are Commanders that border each other, and so it says at the top that Commanders cannot attack other Commanders. The Polish Commanders inside Poland will probably have 5 neutrals each as well, next version will have a representation of neutrals. Air planes can only bombard. that idea is very unappealing. attacking swarms of neutrals is no fun. also even if you had 5 on a tank, someone will attack with their 8 armies 3+2+3 and defeat it easily making the 3 armies on the commander an easy target. you might say, "ok. let's put 8 on the tank" and that's even less fun. Well what if i made it so, Tanks can't attack Commanders. And the only way to kill a commander outside of Poland was by Attacking From a Polish Plane within Poland? (I would have to add these). Bearing in mind that Polish Commanders inside Poland, do not have auto-deploys... And just have one-way attacks to the territories surrounding each Commander, so commanders can only attack out, but nothing can attack in except the center of Poland, which would be a Plane...? you don't think you should give bonuses to holding an entire countries planes? or tanks? Just one major comment for now....the title area grabs one's eyes completely because of the yellow. Perhaps tone it all down a fraction so that the map it the one what sticks out. A+ on the legend. I like the new territory borders, look much better. I would say the gameplay needs some work. I'll get back to you on that in a bit. Bit of gameplay: Von Bock has rather an atvantage in being very close to the central attackything. It could easily be held in one turn, providing a major advantage and possibly even allowing them to knock out one of the other players. You should make it equally difficult for all generals to get to the center. Edit: Didn't notice the tanks. In actual case von runstedt and kovalev have a disadvantage. Maybe shifting a tank to sc6 and gc4 and jigging borders so von R can attack gc4 would be best to solve the problem. Edit 2: also gc7 looks like 2 territs, I'd widen the neck a bit. Gameplay: anyone who goes into Poland dies. You put a plane next to every starting point, meaning that you have a way to bombard any region of Poland just one territory away from a +3 autodeploy spot. Meaning that anyone who even tries to go into Poland will just get themselves bombarded to death. I don't think this is a good thing. the only reason you can go out into Poland is if your enemy does, a standoff since neither will be the one to first get themselves killed. Perhaps if i scrap the "All Planes can attack any territ within Poland" Rule and just make a few of the territs with nothing on them, with crosshairs on them. And they can be the targets for the planes? I think people will advance into Poland. They just have to play a fine line. Don't move too many away from your commander. But don't put too few where they can be easily taken over. I think the question is whether bonuses are big enough to encourage attacking neutrals. shouldn't tanks be worth more than planes since some planes are very easy to grab and harder for other people to take. PC3 for example can only be attacked from Ferdinand Catlos and PC1 tank. Also, who is going attack/take over a Polish Commander with 5 neutrals when taking them gives a +1 bonus? you can increase the bonus to +4 (deployable anywhere) but that might make them constant targets of bombardment by planes. perhaps increase the bonus and make planes only able to bombard tanks whilst making tanks have a +3 bonus for every two held. this makes spreading to Poland both worthwhile and necessary. I can get more bonuses than I can by planes. I need to spread there to be able to stop and/or gain the big commander bonuses. looking nice sammy... I'm a sucker for maps with a historical perspective. Gameplay thoughts: I think tricky rules are fun, especially if the rules fit the unit type. I'm concerned, however that you may have one too many layers of rules. The fact that you've got tanks, planes, and commanders, each of which has special movement/bonus powers isn't so bad, but then there seem to be exceptions to each. The tanks can attack two territories, but not through barbed wire. Aircraft can bombard only, but not everything. Commanders can't attack other commanders, which seems to be a redundant rule because I can't see where they border anyway. And that weird thing in the middle can attack the commanders, but only the ones outside of Poland. As for nobody going into Poland: of course somebody will have to go into Poland, because it's the only way to knock each other out. But Neon Peon is right in that going into Poland could just be prove a lesson in frustration. 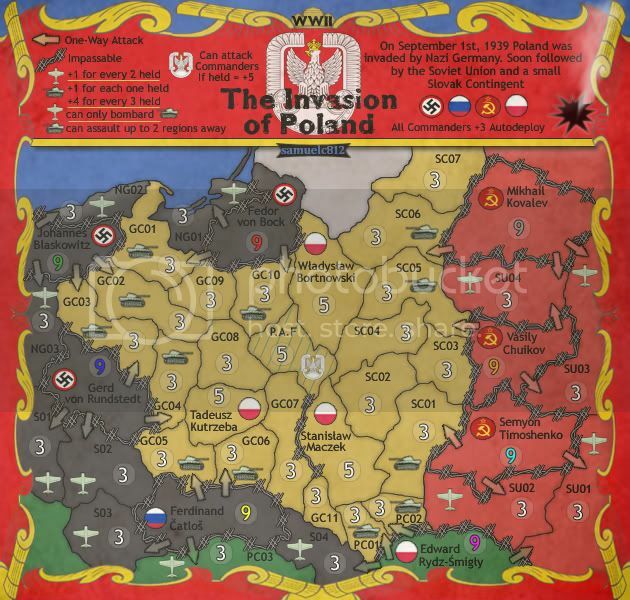 Many games will end with mad-dashes to the center, which isn't befitting a map that is called "The Invasion of Poland." Where's the invasion part? I think that actually taking Poland has to be more attractive. Visually the basic elements are looking very nice - the territories and borders are clean, and I dig the region titles. Tanks and planes look sharp; the fences, arrows, and flags will probably need some more attention. It the legend it isnot explained how commanders outside polish borders can be attacked ..
How can there be one victor if every player keeps his commander ????? And why so strong +3 autodeployment..too much. And this plane bombarding any place in poland..nay-nay too much emphasis on the airfields. better use an idea I had before; separate airdomination "fields"; a string of 6 territories at the side or top of the map..each one linearly attcking the next (for dominance position) and each one capable of bombarding a fixed set of ground territories (f.e. marked with "a", the next "b"). The more airdominance fields you have , the more airdominance you have.. Your gameconcept makes it this a grabbing game between nazi and soviet commanders (and 2 polish outside their own territory???). Please bring it back to something more akind to what it was back then : nazi troops on the left (and some from the north)., polish troops at the border and center..and (only at later stage) soviet troops from the east. ah..so it's the funny eagle in the center that is the crux for attacking otzher commanders (who the hell is that tchec commander in the south??). Not immediately clear in the legend. Now I see what the gameconept is..hmmm, nay. It is very hard to race from a commander to the Warschau center..then you'd supposed to have enough resources left to attack a commander's heart position (bulking with troops of course)..IF the first is lucky to succeed to eliminate one other commander, he has almost NO RESOURCES left,and a THIRD commander throws in his troops on warschau and knocks out the first... and so it goes like a chain reaction. Three (or four) Nazi commanders starting from Germany.. and four Polish commanders INSIDE Poland. Once a Nazi player reaches the east side of the map (a particular territory) that territory (in his colour) gets +2 auto troops (if player controls nazi_A and Soviet_b then +2...so not for the 'polish' players). Like checkers..you reach the other side of the board and you get a bonus checker. This simulates the effect that soviet forces would not start to invade before it was clear that the nazis would totally win poland. but effectively the poles fought againt the nazis and soviets..the soviets didnot fight the nazis. The soviet troops acted like an accessory to the nazis..really.. So i think that is better for this particular 1939 map. ONLY Having/or keeping Warzau should mean a relatively immense bonus...the poles keeping it means "motivation/spirit" (= bonustroops in warzau), for the nazi player having warzau means they "win", lifted spirit, time for reorganisation for final mopping up actions (= bonustroops at the starting position..but much less). Finding the right balance in this bonus for each player is the trick. Great map, would love to see it being played, but I think you should add somemore territory's in Russia, seems to be a bit limited... But other then that love the map and the idea ! Aircraft can only bombard tanks so it is not such a dash to the middle. The Polish Commanders within Poland now get a +3 auto-deploy if held. And The P.A.F (Polish Air-Force) in the centre is the only way to attack another commander, and also receives a +5 bonus if held. 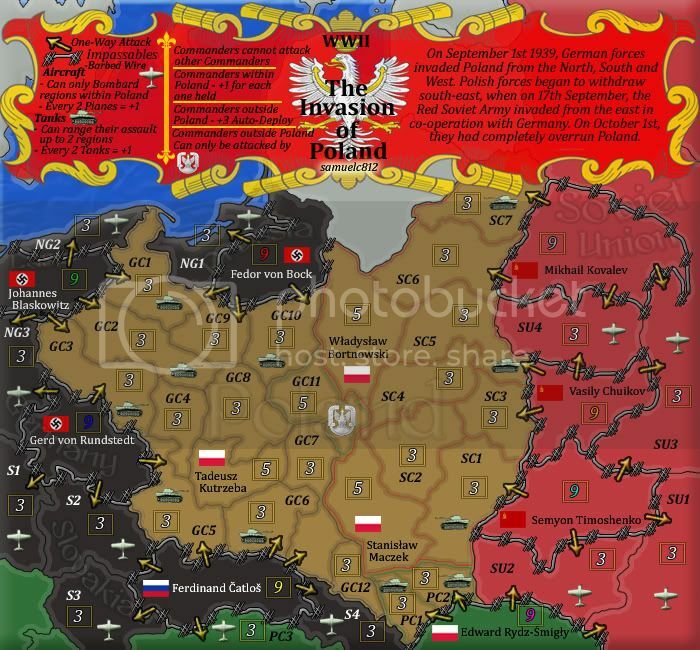 In doing this i have also made it so every player can make it to the P.A.F within 2 moves if they wanted to, and everyone has an equal chance to get a commander within Poland. Also by doing this it has made venturing into the centre more appealing. I have limited the one-way attacks out of each commander. In fact, I remember that the board game RISK was banned there until the object of the game was changed to "liberating the world." I like the look and dull colors though. The map itself is beautiful. What did I miss witht he commanders? You can only attack out from them now, and bombard them, correct? Can this map be moved up to advanced Drafts at least please. cairnswk wrote: Can this map be moved up to advanced Drafts at least please. Juan_Bottom wrote: I like the look and dull colors though. The map itself is beautiful.